Holi, The Festival of Colors presents a wonderful opportunity for art teachers to use bright colors in their art lessons. Colored powders can be used to create powder paintings (similar to sand paintings). Paintings can be created to illustrate the history of the Indian holiday. 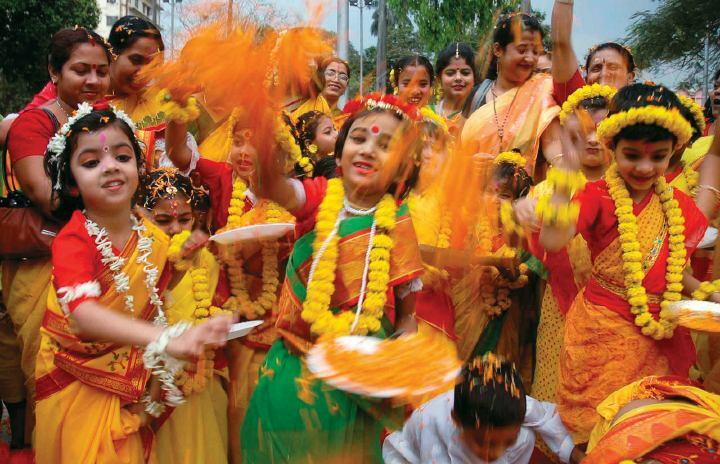 The Festival of Colours, (also called Holaka, Phagwa, Dhulheti, Dhulandi or Dhulendi) is a popular Hindu Spring festival observed around the world. Holi is a time when humans and nature shake off the gloom of winter and rejoice in the colors of spring. The holiday is primarily observed in India, Nepal, and countries with large Hindu populations such as Suriname, Guyana, Fiji, Mauritius and Trinidad. In West Bengal of India and Bangladesh, it is known as Dolyatra (Doljatra) or Boshonto Utsav. The annual festival is celebrated on the day of the full moon in the Hindu month of Phalguna. That month is March in the Anglo calendar. In 2015 Holi was celebrated on March 6. In 2016 it will be celebrated Wednesday, March 23 and in 2017 it will be celebrated on March 13. 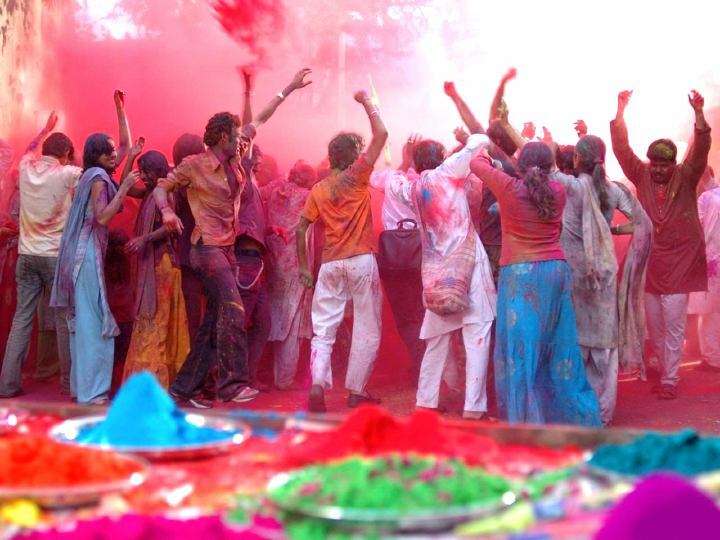 The most important day, Holi, is celebrated by Hindus throwing colored powder and colored water at each other. The Holika Dahan (or Chhoti Holi) is celebrated by lighting bonfires and is the day before the Holi festival. The legend that is commemorated by the festival involves an evil king named Hiranyakashipu. He told his son, Prahlad, that he was not to worship the god Vishnu but to worship him instead. Prahlad worshiped Vishnu anyway. The king became angry and poisoned Prahlad. However, the poison turned to nectar in Prahlad's mouth. The king ordered Prahlad to be trampled by elephants yet remained unharmed. He was put in a room with hungry, poisonous snakes and survived. Finally, he told Prahlad's sister, Holika, to put Prahlad on a pyre over a fire on her lap. It was believed that Holika would be immune from the fire due to her magic shawl. Prahlad prayed to Vishnu (Now called Lord Krishna) to keep him safe. 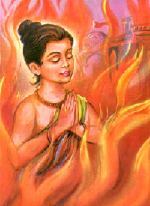 Prahlad was unharmed by the fire, while Holika burnt to death. The king declared that she would be remembered from that point on Holi. Later Lord Vishnu took the form of half-man and half-lion (Narasimha) and killed King Hiranyakashipu at dusk on his porch steps by restraining him on his lap and mauling him with his claws. There are alternate legends to the festival. In one, a Hindu god called Lord Shiva was tempted by Madana, the goddess of love, when she appeared in front of Shiva in the form of a beautiful nymph. Shiva recognized her and became angry. He shot fire out of his third eye and burnt her to a crisp. This is an additional reason for the bonfire during the celebration. Holi is also associated with the love between Radha and Lord Krishna who was reincarnated from Vishnu. The reason why Hindus smear powdered paint on their faces is because it is said that Lord Krishna was jealous of Radha's darker complexion, so his mother told him to smear colors on his face to change his appearance. In most places across the world, the holiday is celebrated over two days. In Vrindavan and Mathura, where Lord Krishna grew up, the festival is celebrated for 16 days. The holiday represents the loosening of social restrictions and norms. The holiday thus brings together people of all castes, sexes, status and age. Calm and polite behavior is thrown out the window as much merrymaking and wild behavior takes place. If anyone becomes offended during the holiday, many Hindus will say, "Bura na mano, Holi hai ("don't feel offended, it's Holi"). Indians celebrate Holi with a bonfire, throwing colored powders and yelling. Note the colored powders in the foreground. Bright colors make this an excellent holiday to create bright works of art. On the evening of the first day of Holi, they hold the public bonfire called Holika Dahan. Hindu boys bring firewood to the bonfire and light it between 10:00 PM and the rising of the moon. Everyone gathers around the fire and shout, curse, and to some, create general mayhem. During Holi, colored water and powders are thrown or applied to faces and clothing. For those who celebrate the holiday over five days, Rangapanchami occurs a few days later on a Panchami (fifth day of the full moon), marking the end of festivities. Colors are traditionally made of Neem, Kumkum, Haldi, Bilva, and other medicinal herbs prescribed by Āyurvedic doctors. Recently, many of the colors are now made synthetically. Traditional Indians are not happy with the artificial colors and believe everything should be kept pure. Because everyone loves a festival, Holi is catching on with non-Hindus. In the UK and US, there are now many Holi festivals celebrated at universities, Hindu temples, and community centers. Because of the use of bright colors, the food, and letting go of inhibitions, the holiday is a popular one among young people. There are plenty of activities for teachers that will address kinesthetic activities for children. One idea is to fill balloons with colored water rather than plain water, and have a water balloon fight. Students can paint each others’ faces with lots of bright colors. White T-shirts, can be colored with fabric paint in splattered patterns. Hold a dance, and let the kids have colored powders available to throw on one another (You don't want to do this in your classroom!). Make sure everyone wears old clothing so there is no worry about color stains. This activity would be more appropriate for school festivals and not during the school day. Cook some traditional Holi dishes - they will also add flavor to your colorful party. An important part of this celebration is to wish people well with cards. Students can create Holi cards by painting colorful scenes onto thick white folded paper. You can find links to food recipes below. Art teachers can always use powdered tempera as a substitute for the Holi colored powder. If you want to be authentic and make it just like those in India make it, you can use the following recipes. Mix equal parts of Nupur Mehendi Henna Powder with flour. Many in India will use dry and finely powdered leaves of the Gulmohur (Delonix regia) tree. Mix one part Turmeric (Curcumin) Powder to two parts Besan (gram flour) . You can also substitute rice flour or talcum powder. There are several ways this is created. One way is to use Red Sandalwood powder . Another way is to use Red Gulal. Flour may be added to add volume. Another way is to grind up dried red hibiscus flowers until it is in powdered form. To increase the bulk add flour. Crush dried Blue Jacaranda flowers into a powder. An alternate could be Blue Hibiscus flowers. Most of these colors can become wet colors simply by adding water. You can also create wet blue by crushing berries of the Indigo plant and adding water. Magenta can be created by boiling beet roots. Saffron can be created with Butea Monosperma flowers by soaking or boiling them. Brown is made with Pure Acacia Catechu Powder and water. This powder is also used as a hair coloring for Indians. Black can be created by boiling dried Amla (Indian Gooseberry) and left to soak overnight. Amla is also used as a hair coloring in India. If you want to save time but still have authentic colors, you can order the Holi powders online. You'll find they are brighter in color to powdered temperas. You can also create your powdered colors by combining a cup of flour with 1/2 cup of water. Add in food coloring until you get the desired color. Form the paste into a ball and flatten with a rolling pin. Allow to dry and then use a coffee grinder to make the powder. Celebrating the Holi Festival in the Montessori Classroom - With activities. Holi Art Activities [Archive] - See art lessons about halfway down the page. Holi Cards - Create a Holi tradition, Holi Cards. Holi, Festival of Colors - A page by Crayola. Putti's World - (Archive) With student art samples. 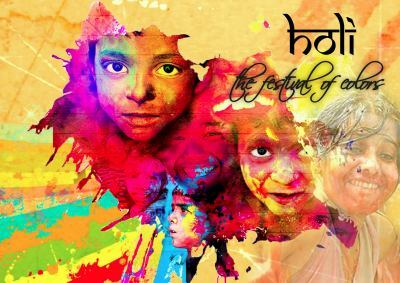 All About the Holi Festival - A detailed background on Holi. History and Meaning of Holi - This site also discusses Holi rituals and customs. Holi Gifts - Buy Holi art supplies directly from India. Top 5 Holi Recipes - Gujiya, Phirnis, Shakkar Paare (Archive) or Namak Pare, Bhaang to drink and thandai or Thandai Ice Cream, and Dahi Bhalla or Aloo Tikki (Archive). 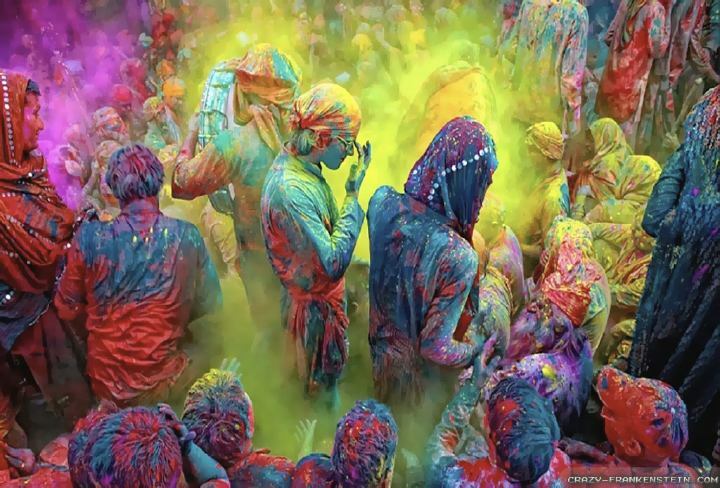 Holi Festival of Colors - A collection of images by Pinterest. Phalano Holi Festival - See images and a description of the holiday. BBC News coverage - YouTube video.